That's exactly how the weather is here in Hyderabad right now. Temperatures are dropping rapidly day after day, a clear indication that the winter has already arrived and its here to stay for few more months to come! It is always the case with me that when cold settles in, I need to make some thick, hot soup to warm up myself, from deep within - perfect to brighten up rather a dull, morose winter's day. Today's recipe of Tomato & Carrot Soup is one such hale and hearty dish. Its filled with goodness of vegetables & herbs with tingling ginger note at the background and a light sprinkling of red chilli flakes at the very end, for some heat. I highly recommend to make this soup, wrap up warm and with a book in hand enjoy with a buttery, crusty bread to keep the chill out. ..and to know more about and participate in the give-way(s), feel free to scroll down to the end of this post for more details. 1) Boil 4 cups of water. Add chopped carrots, coriander leaves and ginger. Cover and let it simmer for 15-20 mins. Discard 2 pieces of ginger from the stock. 2) Meanwhile, heat olive oil in a pan and add garlic & onions. Saute for 3-4 mins until light golden brown. Add tomatoes. Cook until mushy on low-medium heat for 15-20 mins. Add boiled carrots along with stock, coriander leaves and ginger. Season with salt & pepper. Mix well and Let it cool a bit. 3) Blend everything into a smooth soup-like consistency. Add milk and bring the soup to a simmer again and water or stock if desired. 4) Melt a bit of butter in a pan. Place few pieces of bread and cook until golden brown. 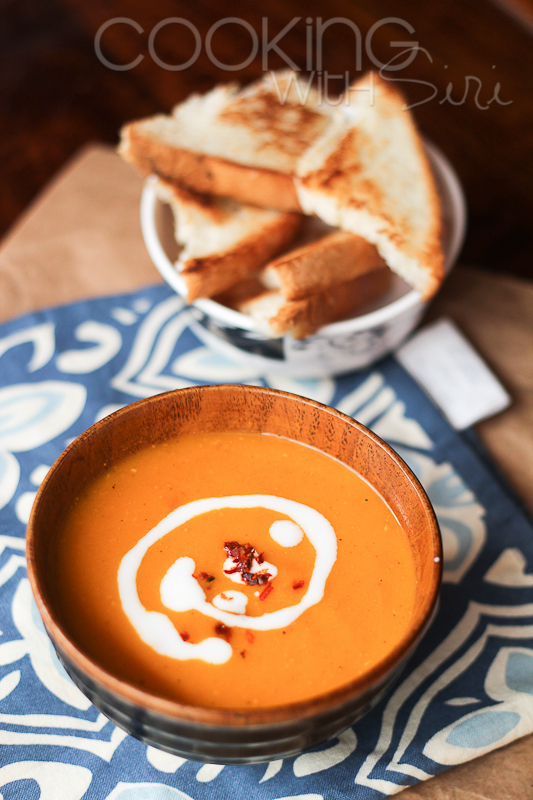 5) Top with few red chilli flakes + beaten yogurt and serve soup with toasted bread on the side. 2) A chance to win a $25 Olive Garden gift card. If you are already liked me on facebook, following on twitter or subscribed to RSS feed, just leave a comment letting me know and you are entered in the giveaway automatically! You don't have to be a blogger to win these give-way(s). Last date for participation is November 30th 2012 midnight IST and two winners randomly chosen will be announced on December 1st 2012. 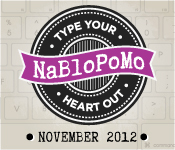 Today is Day 20 of my NaBloPoMo challenge. Check out all of the posts previously published here. The soup deserves a comment, it looks absolutely delicious - even if I do not qualify or the giveaway! The soup looks fantastic! Thanks for the opportunity to enter. I am subscribed to your feed via Google Reader. I want to win! Love Olive Garden & Amazon. I love tomato soup! This sounds so good and tasty! Awesome reciepe for winter. Entering the giveaway! That soup looks amazing! Yum. Never had a carrot soup, but I will have to try this! please enter me in the giveaway! i just made a similar soup last week - roasted carrot, sweet potato, and roasted jalapeno with a whole head of caramelized, sweet garlic. spicy, sweet, and healthy. AWESOME! 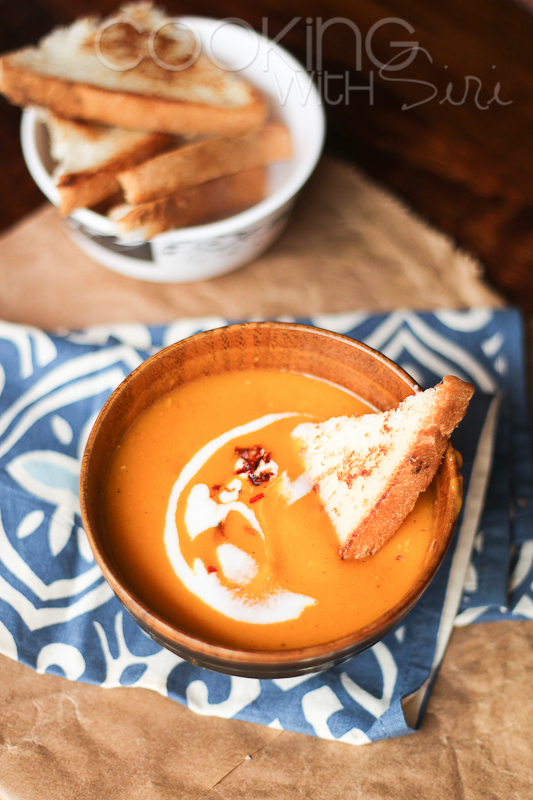 we also top our soups in the same thing - plain yogurt is my favorite! Subscribed the RSS feed. Thanks a mil for the giveaway. God Bless! I was sold on making this as soon as I saw "ginger". Thanks for posting. I love my soups n salad and tomato features in my soup list very often! This looks very very tempting! This has been soup season for me, another delicious one to add to this list! Following you on Facebook, Twitter. Also subscribed to your rss feeds. I love all your recipes tried many of them and love the presentation especially. I Subscribe to Cooking With Siri feed! Oh I love Olive Garden! I heard they have a gluten free rice pasta! My mother in law was an awesome cook. This is one of her recipe. She is no more & hopefully all of you will enjoy this recipe. Ingredients 7 slices of white bread. ( You can use old bread going to get stale etc.or fresh bread. )broken to small pieces 15 or so to each slice. In a large pan add the oil & as soon as it is hot add the mustard seeds. After they splatter add urud & channa dal & hing. After a few minutes add the sliced onions & sautae till they turn golden color. Now add the bread slices, yogurt,haldi & salt. Turn the heat down to low. Cook for 5-7 minites or until all the bread has cooked well to your liking. Keep stirring constantly during this time as you don't want the uppuma to get burnt. Enjoy. My family loves it & will eat any time any day. Must try soup. Great give aways. I would love to win the Amazon gift card or I would enjoy the Olive Garden one, too! Liked Cooking with Siri on Facebook! I followed you on facebook. Would like to enter to win the amazon gift card. This is very healthy soup. Thank you for sharing. This soup looks delicious! Perfect for the cold weather! That soup looks amazing! I think this is a great giveaway and I have subscribed to your blog to keep tabs on all of your yummy recipes! I'm not a big tomato soup fan, but this actually looks VERY yummy! Loving the sound of the carrots and ginger together. I'm definitely putting this on the must-make list! That looks yummy! Thanks for the giveaway!